Our mission is to help protect the citizens that live within the CCMAD boundaries from disease-carrying mosquitoes such as the Culex species, which is the primary vector for the West Nile Virus, to improve the quality of life for District constituents by managing mosquito populations to prevent a nuisance and or economic loss to areas of the district, and to help protect District animal and livestock populations from mosquito-borne disease or parasites. The Canyon County Mosquito Abatement District was formed in the fall of 1997 as the result of a grassroots effort to help control the mosquito population around Lake Lowell (Deer Flat National Wildlife Refuge). The original name of the District was "The Lake Lowell Mosquito Abatement District." 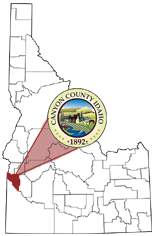 Shortly after the District was formed, the governing body, with foresight, desire and a goal to someday expand mosquito abatement operations county-wide, changed the name to Canyon County Mosquito Abatement District (CCMAD). During the first year of operation, the District had no funds and relied on donations and the hard work of volunteers. The first year proved to be very successful thanks to a work permit granted by the U.S Fish and Wildlife Service to perform mosquito abatement activity on Deer Flat National Wildlife Refuge. As a result, mosquito populations were dramatically reduced and for the first time, district constituents could enjoy summertime outdoor activity and barbecues. Coincidentally, two events happened that further legitimized the purpose of the Canyon County Mosquito Abatement District. The first was the evidence of the presence of Western Equine Encephalitis when cattle that were grazing on private pastures adjacent to Deer Flat National Wildlife Refuge tested positive to the disease. The second event was the discovery of a new disease in New York, West Nile Virus, that was quickly spreading its way across the country. In 2000, CCMAD hired their first Director of Operations and soon after a staff of mosquito abatement technicians. In 2001, CCMAD purchased 2.5 acres of land near the intersection of Highway 45 and Lakeshore Drive, south of Nampa, Idaho. The construction of the operations facility and District offices was completed in 2004. In 2003, the first evidence of West Nile virus appeared in Idaho and in 2005, for the first time in Idaho, mosquitoes tested positive to the disease. The mosquitoes that tested positive were found in Canyon County as part of the results of comprehensive county wide mosquito surveillance by Canyon County Mosquito Abatement District. In 2006, an epidemic of West Nile virus stuck Idaho which resulted in over 1000 reported human cases with 21 deaths. As a result of this emergency, in 2007 Canyon County Mosquito Abatement District expanded its area of operations from 24 square miles around Deer Flat National Wildlife Refuge to over 80 square miles by annexing the cities of Nampa and Caldwell, Idaho into the District's area of operation. In 2008, after the emergency declaration of 2006 and 2007 and the results of an election with over 85% approval, the Board of County Commissioners of Canyon County signed a resolution for the remainder of Canyon County to become annexed into the Canyon County Mosquito Abatement District. Countywide mosquito abatement operations began in 2009. CCMAD operates on Integrated Pest Management principles (I.P.M.) using precision targeting methods that are tied to a pesticide reduction effort. This I.P.M. approach translates into a sustainable method of managing mosquito populations that combine biological, cultural, physical and chemical tools in a way that will minimize economic, health and environmental risks. This approach relies on extensive monitoring to aid in predicting potential insect and disease outbreaks, thus allowing intervention methods to be preventative rather than reactive.